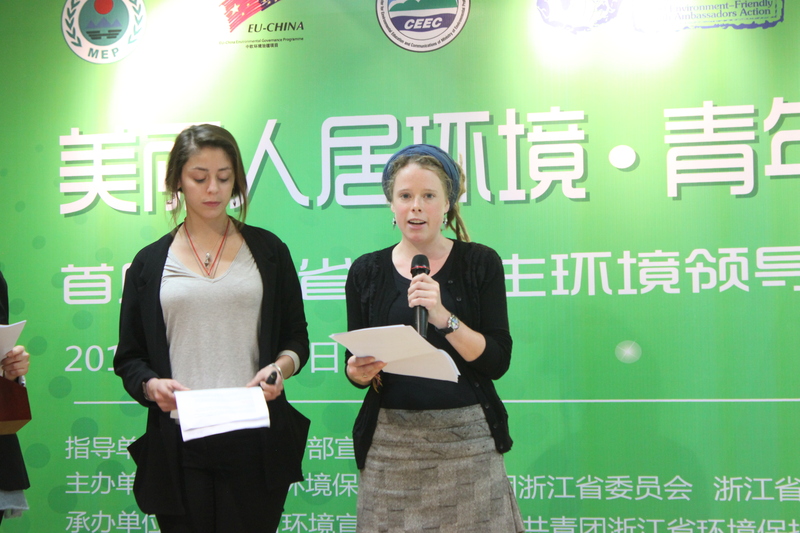 Coincidentally, just after I wrote my last post I was invited to give a presentation with another current Global College student, Paloma Criollo, and GC staff member, Eoife Huo, at Zhejiang’s ‘Youth Environmental Leadership Summit’ that is organized by the central and provincial government’s Environmental Protection Bureau (EPB). Our presentation was on youth leadership and on-the-ground initiatives in the international climate justice movement. From Left: Me, Paloma Criollo, Eoife Huo, and the provincial EPB’s director for media communications. This was an inspiring summit for two reasons. First, it demonstrated that the Chinese state, from the local to the central government, is not only talking about promoting an awareness of the climate crisis, but is actively seeking solutions that will address the problems. 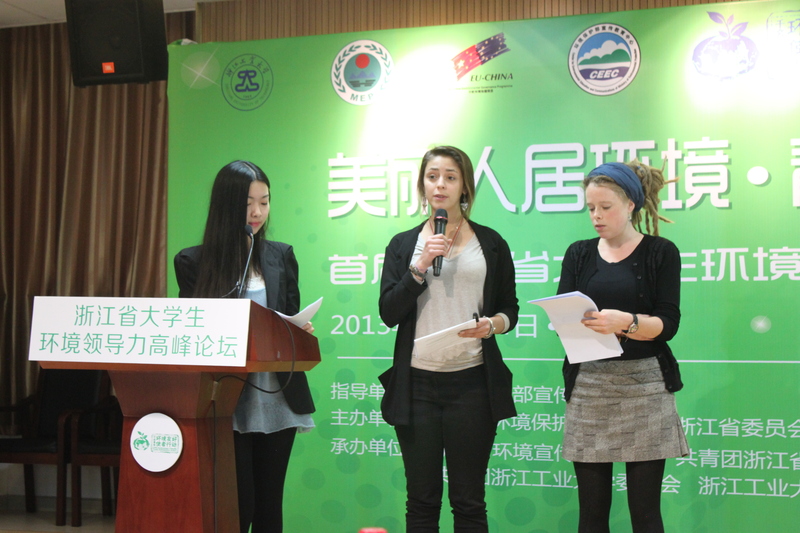 Second, it showcased and celebrated the innovative local initiatives that have already been started by youth to address the environmental crisis (in total, more than 130 people representing 26 different universities from Zhejiang were in attendance). One student shared the recycling initiative she started in her community. Working with a team, she studied people’s waste disposal habits by looking through their trash, then conducted intervention and education based on some of the problems they found. After the intervention they conducted a second survey of people’s trash to quantitatively demonstrate the impact their intervention had on the community’s subsequent disposal habits. One student developed a simple water tester with household materials to gauge how clean your water is. Another student conducted a research project to test which face masks actually work (this is a question anyone living in China asks themselves at some point or another, so its pretty cool that this student actually developed and tested a method to find out). Generally, students presented a variety of school-based education programs they had started. One student made the great point of saying that in order to have a real impact (especially when you are starting out) you have to tap into networks that already exist – and schools are a great place to start. Our presentation, titled “Global Initiatives and Local Practice: The International Youth Climate Movement”, introduced the critical role youth have played in mobilizing people at the local level to take positive action on climate change, as well as at the international level through their participation in the UN Framework Convention on Climate Change (UNFCCC) negotiations. 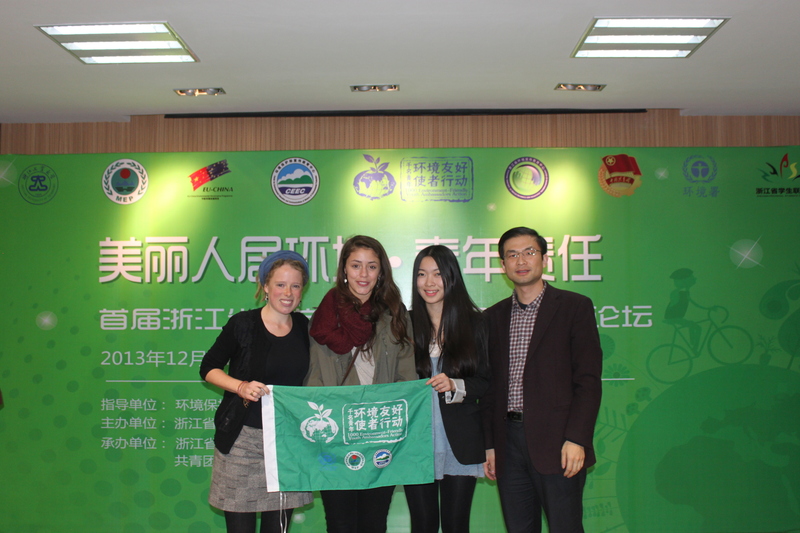 We gave examples of initiatives started by two U.S. youth environmental leaders, Adam Greenberg and Alec Loorz, and introduced the China Youth Climate Action Network as an example of how students can tap into a broader network in China that is active at both the national and international level. It is no doubt encouraging that the Chinese government is celebrating youth environmental leadership. However, events and initiatives that target public awareness and encourage us to think about our individual carbon footprint, although necessary, can also have the unintended consequence of misdirecting attention from deeper, structural challenges. For example, China’s environmental and economic goals directly contradict each other. While the EPB may try to limit carbon emissions, the state is simultaneously promoting urban consumption. As China transitions from an export-oriented economy to one that depends increasingly on urban consumers, I wonder (in the context of a political environment that restricts collective activism) how the government intends to counteract the carbon emissions that are inevitable with this economic transition – especially given the state’s goal to integrate 70 percent of the country’s population to towns and cities by 2025. Unfortunately, at the central level the power of the Economic Bureau outweighs that of the Environmental Protection Bureau. Even within a democracy where there is space for collective action, solutions that target individual consumption practices can sometimes pacify us into ignoring the more powerful culprits – the fossil fuel industry. As long as corporations can single-handedly jeopardize our future with projects like the Keystone XL Pipeline, these companies should be primary targets, and political pressure should be a key strategy. No matter how much I limit my own carbon footprint, the fossil fuel industry will continue to wreak havoc on the environment unless civil society pressures governments to enact regulations and implement policy incentives that curb their extraction practices. Bill McKibben’s divestment campaign is a promising start. 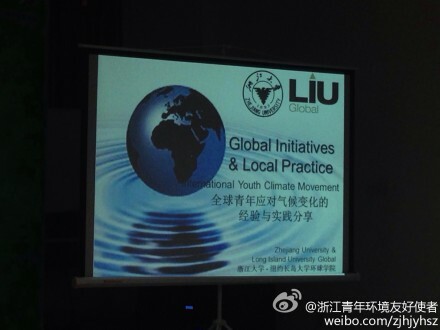 This entry was posted in Conferences and tagged climate change, conferences, environment, UNFCCC, Zhejiang. Bookmark the permalink.